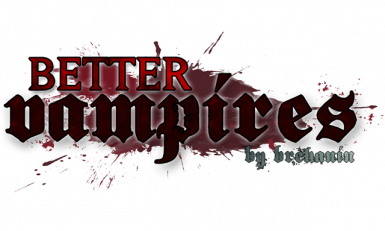 A highly customizable Vampire overhaul; players determine how they want to play. Neither feeble nor overpowered because YOU balance weaknesses and strengths how you see fit. You and those you turn will live your lives as Vampires and feed to enhance your power and abilities. Thank you to the creators of SkyUI and SKSE. Without you my work would be less than adequate. Many thanks to Chesko, Mardoxx, PurpleLunchbox and Shlangster. Chesko's help with implementing my blood meter was greatly appreciated. - Tweaked Flames of Coldharbor to make it a little more powerful. - Tweaked Blood Ward so it doesn't drain as much health to remain active. - Tweaked some SKSE settings in both the Oldrim and SE versions of the mod. - Added in two lines to the PlayerVampireQuestScript so the SE version is up to date with how vampirism is recognized in-game. - SE Version should be used with SKSE64 now ... you can use all functions of the mod with it, including the MCM. - Redid silvered weapons so they have a unique appearance (similar to steel, but with the silver hue). - Added temper recipes for all silvered weapons. - Destruction magic tags were removed from sun damage (apparently mods that increase destruction damage also increased sun damage with unintended results). - Checked the "Disallow Spell Absorb/Reflect" and "Ignore Resistance" for many Vampire abilities - apparently those with really high magic resistance had the duration and potency of Vampire spells diminished. - Added in the ability to engorge on a victim you feed upon when at the highest rank (Nightlord). When a Nightlord Vampire, feeding on a victim you will add to your total Health, Stamina, and Magicka. This can be disabled in the MCM or with my config power. If you cure yourself, the added stats will be removed - if you do get infected again though, never fear because your rank and all stat bonuses will return. - Changed how the eye textures of those you turn are applied. My mod will now use the default vampire eye textures for all races so it will be completely compatible with any eye replacer mod you use. WARNING: Default vampire eyes for Khajiit and Argonians are UGLY so please use another mod to make them look better. - Increased the power of Hemalurgic Spike so it is more useful (50-90 damage depending on your rank). - Updated the main esp file and the Sacrosanct patch so spells will be readily available in regular vampire form without having to turn into a VL first. - Adjusted the Vampire Lord Freedom option so it should be applied upon turning into a VL - no more having to wait an hour to have it kick in (should work with Sacrosanct and Royal Bloodline patches). - Updated the Royal Bloodline patch so my spells, and Royal Bloodline's, can be used in Vampire Lord form. You can also use all of his Vampire Lord perks. - Added A NEW Sacrosanct patch! You cannot use Sacrosanct's style of vampire progression ... but you have access to its Vampire Lord perks, regular Vampire spells, Hemomancy spells, and Vampire Lord spells. Check my mod website FAQ page for more details. - Fixed an issue where, if you selected a clothing change to prisoner's rags, enthralled victims may revert back to their original clothes if you leave a cell and then return. - Fixed an issue where those you turn into vampires may lose their vampiric appearance (or vampirism) if you leave a cell and then return. - An OnLoad function SHOULD help eliminate the Dark Face Bug (only if using SKSE) because it will refresh the NPC and reload their 3D model. It will also happen when you change cells or wait one hour while in a cell with a NPC you turned. - Added a new option to the MCM and Configuration Power; you can now choose to have those you make into vampires not change appearance at all, have them just get a new eye texture, OR have them change their race to a vampire one (only works with vanilla races). - Adjusted Sidestep Reflexes with a delay timer after it activates so it will be unable to cast over itself - this should avoid people's slow time effect getting stuck. WARNING: If you mess with the game's timescale it will mess things up, like sidestep reflexes, because some effects rely on game time whereas others rely upon real life time - Skyrim is set up this way. - Increased the amount you regen Health and Stamina when in direct sunlight once you have Sun Resilience at Nightlord Rank. - Adjusted the Vampire Lord Freedom option so it SHOULD work with console players now (I cannot test here). You should be able to access the map and inventory as a VL. It sets your beast race to false, enables player controls, and enables fast travel; it's all I can do for those on consoles. - Increased the rank when you get to use Blink Attack, it will now only be available for Master Vampires and Nightlord Vampires. - Added in a NEW Vampire Spell - Hemalurgic Spike. It is available once you attain Vampire Nightstalker Rank or higher. A Hemalurgic bloodspike does <20-40> points of damage to Health, absorbs Health, and has a chance to absorb an opponent's skill or ability. Higher ranks do more damage and have a greater chance of success. See my website FAQ page for detailed information about Hemalurgic Spike. 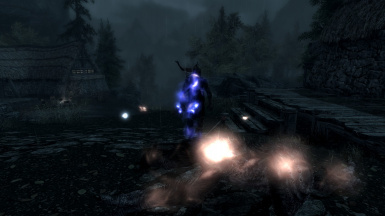 - Added in a NEW Vampire Spell - Flames of Coldharbour. It is available once you attain your highest Rank of Nightlord Vampire. 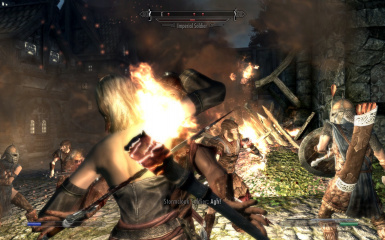 Coldharbour's flames act like a wall of magical fire and do 25 points of damage to Health and Magicka each second. 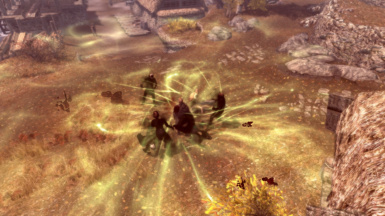 Most mortals flee in terror, whereas Daedra and undead often become frenzied. If you have SKSE, you will automatically learn the Flames of Coldharbour enchantment too! If you do not have SKSE, you will be given a dagger with Flames of Coldharbour that you can disenchant! - Fixed an issue where you couldn't feed on dead bodies as a Vampire Lord. In all other cases, you must be sneaking to feed on the dead or extract blood from them. - Increased the limit of those you can turn into vampires (with Prasestare) to 30. - Turning others uses a reference alias (like Dawnguard) and there is no race change at all, so NO MORE GREY FACE BUG! This also means that those you turn will have gold eyes, but they cannot glow. This also means that those you turn cannot have vampire fangs. - You will be able to turn a maximum of 30 individuals into vampires. After that, you have to cure someone using Tollere or the game will automatically clear your oldest reference alias to make room for your new victim. - Fixed a small bug where you couldn't extract blood potions from a sleeping victim unless corpse feeding was also enabled - they are now independent. - Set extracting blood and feeding on corpses so the extract or feed option will ONLY show if you are sneaking (crouching). This will make looting bodies less troublesome; the option will not show up unless you sneak and the same time and want it to. - Fixed an issue where you couldn't enthrall someone while they were bleeding out. HUGE CHANGE to turning others into vampires! - Turning others now uses a reference alias (like Dawnguard) and there is no race change at all, so NO MORE GREY FACE BUG! This also means that those you turn will have gold eyes, but they cannot glow. This also means that those you turn cannot have vampire fangs. - You will be able to turn a maximum of 10 individuals into vampires. After that, you have to cure someone using Tollere or the game will automatically clear your oldest reference alias to make room for your new victim. - Blanking my mod using the MCM or configuration power will now also release all reference aliases. It will effectively cure everyone you have made a thrall or turned into a vampire. It's not that inconvenient though - just turn or enthrall them again if you wish. This should make blanking my mod more complete and it may (may) avoid a corrupted save message with SE if you haven't cured those you turned. It should leave the lightest footprint possible. It does not have CTDs with Vampire Hunters and the textures for Blood Ward are fine. - BIG CHANGE! I have added an option to the MCM and the configuration power to BLANK my mod. This will reset all globals, dispel all BV magic effects, remove all BV spells, and stop all BV Quests. Please use it help update my mod from an older version to the newest version. NEW UPDATE STEPS FOR ALL OLD VERSIONS --> 7.5! - I have updated the customization power so you can get status updates and more detailed information about your vampirism when using it. If you are sneaking when you use the power, it acts like a hotkey to display your status quickly in the top left corner. - Customization power menu now has three new options at the end: one to turn off the movement speed penalty when outside during the day, one to turn off Sidestep Reflexes (slow time when enemy power attacking) if it is getting stuck for you, and I also added an entry to reset Vampire Lord if that form is wonky for you. - I have tweaked the Vampire Hunters my mod introduces and fixed their textures - it should prevent any crashes with SE or consoles. - I have tweaked Vampire Hunters so, if they are following you, they will NOT spawn right beside you when you enter an interior - they will now wait until you come out. - I have updated the meshes for drinking blood potions and for Blood Wards (only Skyrim SE is affected) - they were missing textures before. - I have changed some quest settings in the SE version to help provide more stability. - Frost Cloud has been adjusted so it costs a bit less to cast at each rank. - Mortals' Mask entry in the configuration power has been fixed so it changes the variable properly. 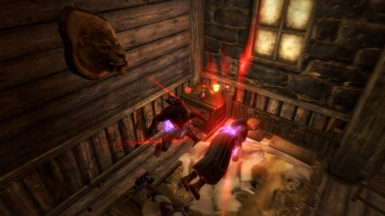 - Added in a new line in the MCM that allows you to access your inventory, spells, and fast travel as a Vampire Lord. - Fixed one line in the attachashpile script to ensure that the body is disabled and only the ash pile remains. - Added in temper recipes for all the silver weapons. 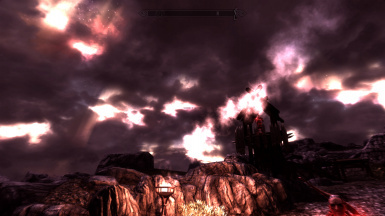 Versions 8.2 and higher for SkyrimSE now have support for SKSE and SkyUI! - Use the customization power that you find in your spell menu (or my MCM if using SKSE and SkyUI) to set all the options for BV - then feed once on a sleeping or seduced victim to solidify your stage, rank, and all options. - Crouch (sneak) while activating my customization power to see your Vampire status. - If using SKSE and SkyUI you can customize hotkeys to check status or use abilities. - Use my customization power to look at your Vampire details to see your rank progress. - If using SKSE and SkyUI you can use my MCM to see details about your vampirism and refer to progression charts. You progress as a Vampire depending upon your satiation and how many victims you have fed upon. You determine if you wish to be more powerful when fully fed or starving. You can control feeding! -----> each time you feed you add to your satiation and progress one stage.Each feeding victim adds to your power and helps you advance through Vampire ranks. If you want to, you can also choose to advance through ranks based on your days as a vampire. Specific messages let you know what rank and stage of vampirism you have entered, and messages keep you informed of your satiation levels. (STAGE 1 ---12hr---> STAGE 2 ---6hr---> STAGE 3 ---3hr---> STAGE 4). If you enable two stage feeding, you will either be fully fed (lasting 24hr) or starving. You can choose to progress as a Vampire depending on the number of Blood Points you currently possess. This option is ONLY available if you choose reverse progression. Each time you feed you will receive Blood Points for your use, and they will fade slowly over time. Use your blood pool wisely though ... because using your abilities will consume points and you'll progress faster toward being starved and weak. You can choose to have Vampire Drain (and Drain Life and Vampiric Grasp if you are a Vampire Lord) affect your satiation. You determine if you want using these spells to drain some blood away from your victim and nourish you. If you drain enough away it can affect your stage of vampirism and blood points (if they are enabled). Different stages of your vampirism will bring about new strengths, powers, and weaknesses. You have in-depth knowledge of your vampiric state and you will know when your blood reserves will deplete. A detailed description of your Vampiric Stage can be found under "Active Effects" - it also has a timer (real life time) to let you know when you will progress to the next stage. I have also implemented a customizable hotkey (X by default) that lets you track your Vampire status – it requires SKSE. A new fully customizable blood meter can display your blood levels if you wish. Long-term feeding on victims will enhance your vampirism and you will enjoy stronger attacks, increased defense, and all new additional abilities. on feeding victims and your level, or just the number of feeding victims. You can also choose to have ranks based on your days as a vampire and have it independent of your feeding victims. attack without remorse. An illusion spell will temporarily hide your true form and remove all hate, but it is taxing to maintain and will wear off eventually. You will be weaker in the light of day and much stronger at night or inside. You can choose to have true sun damage; it will behave realistically. If you choose to enable sun damage you may not take damage during really overcast weather or while in shadows - health and stamina will slowly regen as well if light levels are low enough. You can also customize the light level threshold which determines if you are in shadows or not -useful if you use an ENB or have altered the vanilla light levels. As a Vampire, you can feed on those who are asleep, paralyzed, seduced, bleeding out, or even those recently dead if you choose. eventually drain them of all of their blood and kill them if you overfeed (two feedings in a row usually does them in). If a NPC is set to be essential, they won't die, but a variable will be set on themto disallow further feeding. If you wait 24 hours after feeding on an NPC, the health damage from your feeding will be fully restored. You have the option of having dead bodies help advance you through vampiric stages and ranks - or not. Once you reach Nightlord Vampire rank, Amaranth can allow you to feed on other Vampires with a chance to absorb some skill from them. This will completely drain and kill the other Vampire; you will not be able to feed on those you have turned into Vampires. In combat, if you have more health than your victim, you will be able to "Bite" a staggered opponent if you are within activation range. This will damage and drain away a portion of their health - giving it to you - and replenish some blood points (if you have this enabled). It doesn't count as a feeding, but it does require some stamina to perform (like a special move). Damage done increases as you level. At your highest rank, you will also be able to earn perk points in exchange for ongoing feeding. With normal progression, every 80 feeding victims will result in the addition of one perk point; 40 feeding victims are required with easier progression for each perk point. SKSE is required to add perk points. This mod has its own method of extracting Blood Potions (if you enable it). You can extract blood from victims that are sleeping, paralyzed, knocked out, seduced, or even from corpses (if you choose). Blood Potions will heal you (health, stamina, and magicka) and perhaps satisfy your hunger (if you enable it), but they will not add to your number of victims for rank progression. If you extract blood from a victim twice in 24hr you will kill them – just like overfeeding will. If you extract blood from a corpse, it will give you a weaker version called a Stale Blood Potion. You need to be crouching (sneaking) to extract blood from corpses. You can choose to make your feeding victim into a Vampire. Others that you bestow with the gift of immortality will willingly join you as a follower (if possible). Those you turn into Vampires will have vampiric strengths/weaknesses and abilities. Those you turn will feed when they hunger (can be disabled if you wish). You can choose to make a helpless victim into your thrall (Vampire Cattle). Victims will willingly join you as a follower (if possible), or they will stand mesmerized in place - waiting for their master to feed on them. You have inherited the Vampire's weakness to silver. If you should suffer an untimely demise, Tamriel will have nothing left but your ashes to remind them of your existence ... Your body will turn to an ash pile upon death - tragic yes, but befitting a Vampire. Turning to ash can be disabled if you wish. There is so much this mod contains that a description cannot do it justice. This is a very old video I made for Better Vampires 6.31 (1080p). A great deal has been changed/added since.